High Holidays Days are a time for reflection, introspection, prayer, and re-connection. We welcome you to join us in celebrating and observing these special Holy days. We offer a variety of services to meet the spiritual needs of our diverse community. Please see the Schedule of Services for a list of dates and times of services. For families with children, we have children’s Rosh Hashanah and Yom Kippur services that run concurrently with our morning services. For older children, you can drop them off at the children’s service, but for the younger children, it is good if at least one parent remains with their child at the children’s service. At these services, our religious school students learn about what each holiday means. 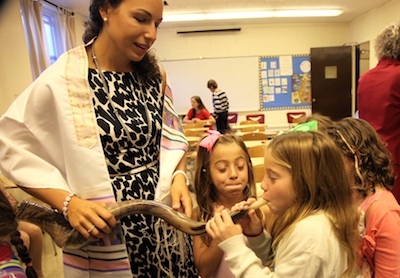 Shofar blowing, challah making, and sukkah decorating are some of the activities at these children’s holiday services. Come share the spirit and wisdom of Rosh Hashanah and Yom Kippur. These holidays are a time of prayer, music, reflection and learning. Come and join our congregational family for a simply spiritual High Holiday experience. All members are entitled to attend our High Holiday services. Because we are a small congregation and we know all of our members, we do not use tickets for High Holiday services. Members can invite other non-member relatives and guests for a nominal cost. If you are not a member of the congregation and not yet ready to make that commitment, we can arrange something so that you can experience our holiday experience. We look forward to sharing a wonderful High Holidays together!